Lobster and langoustine may get the glamour roles in Scotland’s stellar shellﬁsh line-up, but crab is starting to nip at their heels, as Donald Reid found out in Orkney. Unlike many parts of the British Isles, Orkney still has lots of small ﬁshing boats. There are around 100 of them, at work around the coast, in the sounds and the large protected waters of Scapa Flow, giving a palpable sense of activity to harbours such as Stromness and Pierowall. The Orkney archipelago has 1000 miles of coastline, yet the relatively close grouping of the islands creates a lot of shallow, sheltered water, while the strong tidal streams around the Pentland Firth means that there’s plenty of cleansing water movement and good feeding for all sorts of sealife. The small boats, each employing two or three ﬁshermen, are mostly at work laying and lifting creels, catching velvet crab, lobster and, in the main, brown crab. Orkney has the largest brown crab ﬁshery in the UK, landing 2000 tonnes a year, over 20 per cent of the total Scottish catch. In Stromness the Orkney Fishermen's Society operates one of Europe’s largest and most sophisticated crab processing factories. A cooperative, with over 75 per cent of local crab ﬁshermen belonging to it, the OFS employs 70 on-shore. Whole crabs have a much lower market value than lobster or langoustine. Commercial processing, however, add signiﬁcant value. Only ﬁve per cent of the crabs landed by local ﬁshermen are sold whole. With the rest, the OFS factory produces the majority of the of bespoke crab products – such as dressed crab and claw meat – sold in UK by retailers such as Waitrose, M&S, Sainsbury and Morrisons. Around a third of their output is exported to France, Italy and the Far East. Even still, Stewart Crichton produces the startling statistic that less than ﬁve per cent of UK population have ever eaten crab. Langoustine may be way out ahead in their economic worth to Scotland’s ﬁshing industry as a whole, and lobster clings hard to its luxury cachet, but for many crab has as much to offer as its crustacean cousins. 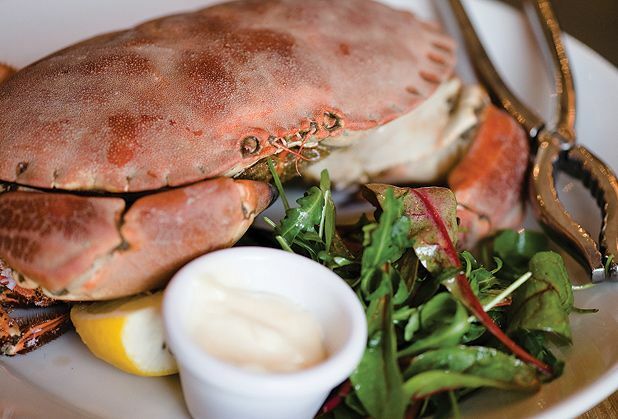 It does enjoy a more established place in Scottish food heritage – you’ll ﬁnd partan bree rather than lobster bisque in local cookbooks, and if you’ve got time, then cooking, dressing, picking and eating a crab is rewarding and tasty – albeit a little messy. Until recently, crab were largely ignored as a commercial catch in Orkney. When the OFS was established in 1953 it was lobsters being packed onto chartered DC3 planes on their way to France. There was awareness of the potential for crab, but even 40 years later the onshore operation still involved just four people processing the catch in a shed on Stromness pier. The new factory built by the OFS in the mid 1990s initially handled 200 tonnes of crab a year. It has been extended many times as capacity has increased ten-fold. One of the reasons for its success is that it has largely been funded by the ﬁshermen themselves and shareholders in the wider community who supported them. Part of the current investment is to ensure that the ﬁshery remains viable. The OFS works closely with Orkney Sustainable Fisheries Limited, which now employs a shellﬁ sh sustainability ofﬁcer. Their work includes tagging crabs to look at migration and movement around spawning, recording discard from pots to demonstrate the selectivity of the ﬁshery, and analysing the size of the crabs caught (the average size of crab landed for processing in Orkney is currently ten per cent above the legal minimum) to understand the population structures. There’s also work underway looking into the ﬁshery’s relationship to other marine interests in Orkney. The same fast-moving waters that enrich the seas are also being explored in Scotland’s foremost wave- and tidal-energy projects. Far from disrupting the ﬁshing ﬂeet, by keeping creels away from the renewable energy sites, no-take zones are created that contribute to the regeneration of stocks. It’s an encouraging synergy, and offers further proof that at the moment there rarely seems to be a sideways step for the crab industry of Orkney.